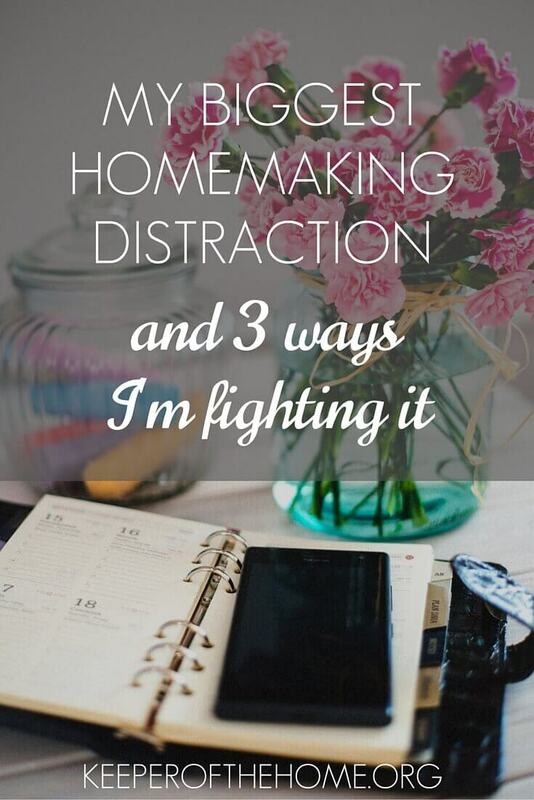 Although crafting routines and implementing a very simple meal-planning technique have helped me get my homemaking closer to where I want it to be, the key was discovering my biggest homemaking distraction. It was something my mom never had to deal with when I was growing up, so I didn’t have an example of how to handle it. But every day, I found that I spent hours on my computer, and my homemaking took a hit. You see, the internet is my biggest homemaking distraction. And I never saw it as a distraction because I use it for important, necessary things. It’s not like I spend hours playing minesweeper or stalking celebrities! Those aren’t bad things, are they? But I had to realize that the internet is a bottomless pit. There is no end to the things I could be doing–and often feel I should be doing–online. When I spend too much time attending to the “urgent” things of the internet, things fall apart in my home. I want my home to be a haven for my small family, not a vortex of chaos. I want it to be reasonably tidy and clutter-free, with nourishing meals that are ready to eat at a decent hour. I want home to be a place where we can recharge and enjoy each other.